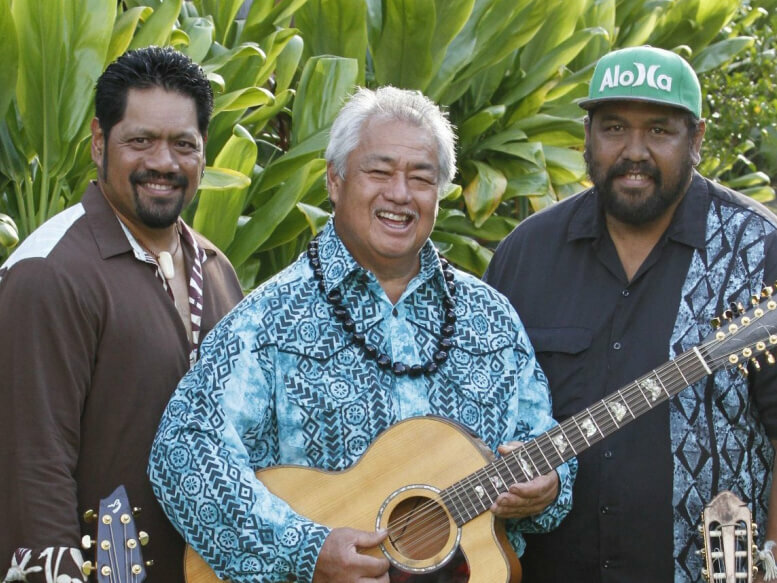 This show marks George Kahumoku, Jr’s fifth time performing in Chatham, now one of his favorite stops during national tours. The four-time Grammy winning slack key guitarist is known as “Hawai‘i’s Renaissance Man”, is a multiple Nā Hōkū Hanohano (Hawaiian Grammy) Award winner, a vocalist, storyteller, songwriter & author, teacher, sculptor, farmer, and chef. Nathan Aweau is a musical force who served as Don Ho’s bassist and musical director for 15 years. The New York Times wrote, “Nathan… on electric bass and acoustic guitar, shows an… advanced understanding of harmony and orchestration …his singing style is effortless.” His seven solo CDs have won him multiple Nā Hōkū Awards, including Male Vocalist of the Year (the only person to have won 3 times), Song of the Year (twice), and Island Album of the Year, among others. Slack Key guitarist David “Kawika” Kahiapo recently won two 2015 Nā Hōkū Awards for Slack Key Guitar Album of the Year and Island Album. He has contributed his musical talents to over 84 recording projects with a who’s who roster of island artists including Jack Johnson, Kaukahi, Palani Vaughan, Melveen Leed, and others. His slack key roots and commitment to Hawaiian culture run deep. Hawaiian slack key guitar, kī hō‘alu, is one of the world’s great acoustic guitar traditions. Relatively unknown outside of Hawai‘i, slack key guitar is often confused with and actually pre-dates the more well known Hawaiian lap steel that developed in the late 1880s. Slack key was developed by Hawaiian cowboys who “slacked” the strings of guitars brought by Mexican cowboys hired by King Kamehameha III to teach Hawaiians better ranching methods. Slack key is a finger-picked style, and the tradition continues to evolve from techniques and tunings handed down through the generations. For additional information, contact Andy Wang at (973) 400-9264 or visit www.andywangmusic.com/masters. I was wondering if Jeff Peterson will be playing on Monday night. I don’t see his name on the website but I believe it mentions him in the paper. My mom (90) was dear friends of Jeff’s grandparents and I would love to bring her. Can you confirm if possible?